This morning the story of the ghoulish terror video of children being indoctrinated with profanity-laden IRA songs was covered by the mainstream media in the form of U105. This is a positive example of how Unionist Voice and grassroots activism can highlight relevant issues. For quite some time loyalism has been an easy target for mainstream media and republican politicians and commentators. Due to a lack of effective engagement, loyalism was easy to demonise. This all changed in July 2017. In East Belfast, after the heinous targeting of Unionist cultural expression zones, loyalists in the area took a different approach. Rather than fall into the carefully laid trap designed to bait loyalism into a violent reaction, activists in the area instead began to positively engage with the media in order to articulate loyalism’s case and alongside this took a strategic and peaceful approach to forensically dismantling the injunctions and exposing the numerous flaws within the council’s procedures. This change may have went unnoticed. But it was seismic. There is a new realisation that there is a cultural war, and for too long it has been all one-sided. It is time to agitate back. To use a rather apt metaphor- it is time to terrorise the terrorists. If the nationalist community want to target every aspect of Unionist culture, then Unionism will be equally forensic. There will be no cultural supremacy for the nationalist community. Unionism will not be an underclass with our culture demonised whilst nationalism, via linguistic warfare strategies, swan the stage as peacemakers and progressives. No longer will Unionism bunker in, defending ourselves from relentless cultural attacks. There will be a new offensive to highlight the hypocrisy of Sinn Fein and their allies. The appalling Damien Quinn video, exclusively exposed by this site on Saturday morning, highlights the sheer hypocrisy of Sinn Fein. In November 2016 comedian and Sinn Fein representative Barry McElduff was outraged that the RAF Army Cadets had been mentioned in a school in Omagh. Yet Sinn Fein have remained silent on a video of young children singing profanity-laden IRA songs mocking the murder of 18 British soldiers. The focus must stay firmly on this video, on this issue. Attempts to widen the discussion into a debate about loyalist and republican songs per se is a red herring. Nothing more than an attempt to spread the blame and make it a more general discussion. This tactic is straight from a spin-doctor’s handbook. Instead let us keep the focus where it belongs; on the indoctrination of young children with pro-IRA propaganda in the form of vile profanity-laden lyrics. Do not be diverted into looking at ‘wider issues’, this is about a specific issue. 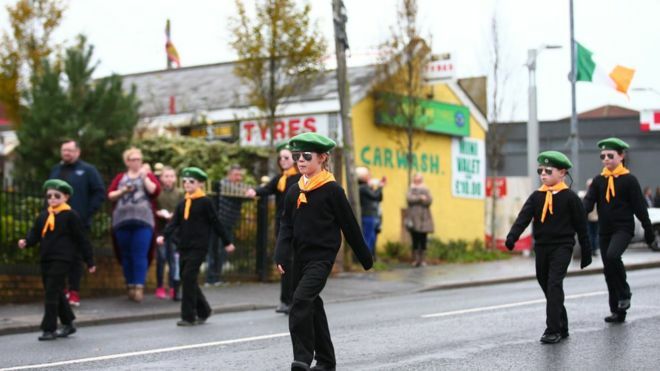 After succeeding in exposing the planned terrorfest under the guise of a Celtic ‘fanzone’ in July and highlighting the pro-IRA chanting at the West Belfast festival, Unionism is now shining a light on the pro terror indoctrination of young people. We are returning the serve, and they do not like it one bit. 124 Responses to "EDITORIAL: Unionism fighting back in the cultural war, and republicanism do not like it one bit"
| Unionist Voice <Liked it! of my blog visitors have complained about my blog not operating correctly in Explorer but looks great in Chrome. totally, but this article gives good understanding yet. Such clever work and coverage! Keep up the amazing works guys I’ve included you guys to my blogroll. I got this web page from my pal who told me regarding this website and at the moment this time I am browsing this site and reading very informative content at this time. I have been exploring for a little bit for any high quality articles or weblog posts in this kind of area . Exploring in Yahoo I at last stumbled upon this website. Reading this info So i’m glad to express that I’ve an incredibly excellent uncanny feeling I came upon exactly what I needed. I such a lot without a doubt will make sure to don’t disregard this site and give it a glance regularly. The very core of your writing while appearing agreeable initially, did not really settle very well with me personally after some time. Someplace within the sentences you were able to make me a believer but only for a short while. I nevertheless have got a problem with your leaps in assumptions and you would do nicely to fill in all those gaps. If you can accomplish that, I would undoubtedly be fascinated. Thanks for the blog post, how can I make is so that I get an update sent in an email every time you make a new article? Someone essentially lend a hand to make critically articles I would state. That is the very first time I frequented your web page and thus far? I surprised with the research you made to make this particular publish extraordinary. Excellent task! Thank you for another great article. Where else may anyone get that type of information in such a perfect method of writing? I’ve a presentation next week, and I am at the look for such info. F*ckin’ tremendous things here. I’m very satisfied to look your article. Thanks a lot and i’m having a look ahead to contact you. Will you kindly drop me a e-mail? Heya i’m for the primary time here. I came across this board and I in finding It really useful & it helped me out much. I am hoping to offer one thing back and aid others such as you helped me. of course like your web site however you have to check the spelling on several of your posts. Many of them are rife with spelling problems and I in finding it very bothersome to tell the truth nevertheless I’ll certainly come back again. I wish to express my appreciation to the writer for rescuing me from this type of circumstance. Right after looking out throughout the search engines and coming across strategies which are not beneficial, I believed my life was well over. Being alive minus the strategies to the issues you have solved by way of your article is a critical case, and those which may have negatively damaged my career if I had not noticed your site. Your mastery and kindness in playing with every part was important. I am not sure what I would have done if I hadn’t come across such a stuff like this. I’m able to at this time relish my future. Thanks a lot so much for this professional and result oriented help. I won’t be reluctant to endorse your blog post to anybody who wants and needs guide on this subject matter. Hey there! Someone in my Facebook group shared this site with us so I came to give it a look. I’m definitely loving the information. I’m bookmarking and will be tweeting this to my followers! Terrific blog and fantastic style and design. fascinating things or tips. Maybe you can write next articles relating to this article. I surprise how a lot attempt you put to create this type of fantastic informative site. I wonder how so much effort you put to create one of these fantastic informative site.